The aims of this work were to study the occurrence of fungi associated to Paspalum dilatatum, P. notatum, Bromus biebersteinii and B. catharticus and to evaluate their potential as antagonistic agents against fungal pathogens. The genera Acremonium, Alternaria, Aspergillus, Curvularia, Fusarium, Penicillium and Stemphylium were the most representative isolated fungi. The isolates of the genus Acremonium showed antagonistic activity against different putative pathogenic species tested in dual cultures. The results suggest that the interactions and mechanisms of antagonism of the same strain vary according to the putative pathogenic strains to which they are faced to. The results encourage further studies to elucidate if the strains isolated in this study are good candidates for biological control of latent pathogens in pastures. To accomplish this, future studies focused on the analysis of the secondary metabolites produced by the antagonists in the culture medium, as well as assays in planta will be conducted. Fungal endophytes may occur in most plant species. The term endophyte, first proposed by de Bary , refers to organisms that colonize internally plant tissues and live in them in an asymptomatic way, for all or at least a significant part of their life cycle . It is a unique cost-benefit plant-microbe association defined by location, not function, where none of the interacting partners is discernibly harmed, and the individual benefits depend on both organisms. Endophytic fungi are a very diverse polyphyletic group of microorganisms that can thrive asymptomatically in aboveground as well as belowground plant tissues . Endophytic fungi form complex relationships with host plants; they utilize nutrients and energy from the plant, while plants may benefit from bioactive metabolites that endophytes produce [3,4]. These metabolites may be able to inhibit or suppress a broad range of organisms, providing protection to plants against nematodes, herbivorous insects, bacterial and fungal pathogens . In this regards, there is detailed literature providing information on pathogens suppression by endophytes [3,6-8]. Other revisions report endophytes that have been used in seed treatment, substantially limiting the negative effects of biotic and abiotic stress in plants [9,10]. Particularly in pastures, where the establishment of forage species is affected by multiple biotic and abiotic factors, the potential benefit of this partnership opens an attractive perspective for biotechnological application, such as the biological control. Biological control was defined by Baker  as the decrease of the inoculum or the activity of pathogenic species by the action of one or more microbial organisms (control agents) including the host plant and excluding human. Biological control mechanisms include the production of antibiotics and antifungal enzymes, competition for nutrients and induction of own host plant defenses . Taking advantage of naturally occurring antagonistic interactions to control pests is an ecologically relevant alternative to chemical-based pest control . In the case of vertically transmitted endophytes, it may also be a cost-effective strategy as the agent can be self-replicating, so that continual applications are not necessary . Paspalum dilatatum (Poir) and P. notatum (Flüggé) are summer-grasses and Bromus biebersteinii (Roem and Schult) and B. catharticus are winter-grasses widespread in Argentina. They are important forage grasses, especially as regards high productivity, resistance to both, drought and water excess, and vigorous re-growth ability . The isolation of endophytic fungi associated with these species is a good strategy to identify agents potentially useful for biological control in native plants. This work was addressed to: i) determine the occurrence of fungal species in P. dilatatum, P. notatum, B. biebersteinii and B. catharticus, and ii) evaluate in vitro antagonistic effects against putative fungal pathogens of the same forage species, in order to assess their potential as biological control agents. Plant samples of P. dilatatum, P. notatum, B. biebersteinii and B. catharticus were collected in Zavalla (32°43´S; 60°55´W) and Funes (32°55′S; 60°49′W), Santa Fe, Argentina. Sampling was done taking into account a separation distance of at least 2 m between plants, in order to avoid taking plants of the same genotype . At each sampling site, whole plants with (color change, wilting or necrosis) or without symptoms of disease were collected for the isolation of fungi. Stem and leaves sections were selected at random, stained with lactophenol blue and methylene blue and then observed by a Zeiss (Germany) KF2 binocular microscope (40x and 100x). The presence of fungi was confirmed by the appearance of mycelia in the intercellular space of the different tissues [17,18]. Before starting fungal isolation from plant organs, a triple sterilization was carried out, immersing leaf and stem portions (1-3 cm) in alcohol (90% v v‑1) 1 min, sodium hypochlorite (50% m v-1) 9 min and alcohol (70% v v-1) 1 min. Finally, three washes with sterile water were performed and the samples were dried with sterile filter paper under a laminar flow cabinet. Fragments (3-5 mm) of leaves and stems were placed in 9 cm Petri dishes (6 to 8 each) with potato dextrose agar (PDA) and 3 drops of lactic acid in order to control bacterial growth. Two biological replicates for each tissue from the same plant were obtained. All the material was incubated in a growth chamber at 28°C in darkness for 20 days. Pure cultures of fungi were obtained, taking portions of 5 mm and inoculating the fungus individually in Petri dishes with fresh PDA. Fungal occurrence was taken as positive when it was detected and/or isolated in at least one sample of each plant. Fungal isolates were maintained at 4°C, and re-streaked every three months. Dry micelia were stored at -20°C for long term preservation. Macro and microscopic morphological data of the fungal isolates were recorded. Fungal structures were stained with lactophenol blue and methylene blue and then observed by a Zeiss (Germany) KF2 binocular microscope (40x and 100x) based on the technique reported by Arenas . Briefly, the adhesive side of a tape is pressed against the fungal colony, and glued to a glass slide with a drop of the corresponding dye. The distribution of intact fungal structures in microculture was also observed . To this end, a portion of sterile PDA (1 cm × 1 cm) was deposited directly on a slide in which the fungus was spread. The slide was placed in a Petri dish with filter paper imbibed in sterile water, and incubated at 28°C in darkness during 7 days. The shape and size of spores, hyphae, sporangia, and presence or absence of septa was recorded. Fungal isolates were grouped into morphotypes and identified following taxonomic specific keys [2,21-27]. The endophytic fungi were incubated in PD medium with no antibiotics during ten days at 28°C with agitation. Then the cultures were centrifuged, the supernatants were discarded and the mycelia were stored at -20°C until DNA extraction. The DNA extraction was carried out using the protocols published by Möller et al and Allen et al [28,29]. Briefly, dry mycelia (60-75 mg) were grinded in a mortar and pestle with liquid nitrogen. Then, the mycelia were disaggregated in 2 consecutive incubations, the first one with SDS (2% m v-1) and proteinase K (50 μg) at 60°C for 60 min followed by the addition of CTAB and an incubation at 65°C for 10 min. The samples were incubated on ice with a mixture of chloroform: isoamyl alcohol (24:1) for 60 min and then centrifuged at 10000 rpm for 10 min at 4°C. The aqueous phases were transferred to new tubes and were incubated with 5 μl RNAase (1000 μg mL-1) at 37°C for 1 h. Then, another chloroform:isoamyl alcohol extraction was performed and the DNA from the upper phase was precipitated with isopropanol 70% (v v-1). Finally, the DNA was re-suspended in 50 μL of buffer TE (10:1) and checked by electrophoresis in 1.5% (m v-1) agarose gels. Genomic DNA (2-10 ng) was used as template in PCR reactions using the primers ITS1 and ITS4 to amplify ITS (ITS1-5.8SITS2) region, and primers 983 and 2218R to amplify the elongation factor 1 alpha (TEF1) gene (Table 1) [30-32]. The following thermocycler conditions were used: initial denaturing at 94°C for 3 min; 40 cycles of denaturing at 94°C for 30 s, annealing for 30 s; extension at 72°C for 2 min; and a final extension step of 72°C for 10 min. The annealing temperatures were 55°C ITS1- ITS4 and 59°C for 983-2218R. The amplification products were evaluated in agarose gels 1.5% (m v-1) and the samples showing single bands were sequenced. Table 1. Primer sequences used for PCR analysis. aR (A or G), Y (C or T) and H (A or C or T). Each sequence fragment was subjected to an individual BLAST search (Basic Local Alignment Search Tool of the NCBI) to verify its identity. Also, the newly obtained sequences were aligned with fungal sequences from GenBank using the PHYLOGENY platform with default parameters in operation. This tool includes MUSCLE for multiple alignment, GBLOCKS for alignment curation, PHYML algorithm to estimate maximum-likelihood in phylogenetic analysis and TREEDYN for tree rendering [33-36]. Where KR is the radius of the pathogen from the midpoint of inoculation to the edge of the colony in the control culture (without confronting antagonist), and R1 is the radius of the pathogen from the midpoint of inoculation to the edge of the colony in the direction towards the antagonist colony in dual cultures. The PGI were classified as follows: 0 = no growth inhibition of the pathogen; 1=1-25% growth inhibition of the pathogen (very low); 2=26-50% inhibition of growth of the pathogen (low); 3=51- 75% (moderate) and 4=76-100% inhibition of growth of the pathogen (high). The zone of inhibition, defined as the distance in millimeters between the pathogenic fungus and fungal antagonist after 14 days of growth in dual cultures, was also measured . Pathogenic fungi isolated from diseased plants of P. notatum, P. dilatatum, B. biebersteinii and B. catharticus used as inocula in the dual cultures were: Alternaria alternata (Fr.) Keissl (046), Alternaria sp.1 (035), Curvularia clavata (B.L.) Jain (048), C. pallescens Boedijn (044) and Fusarium sp.1 (049). The number of endophyte species isolated from plants of the genera Paspalum and Bromus were recorded and the percentages of endophyte infection were calculated by sampling area and by plant species. The PGI of the pathogenic fungi tested was transformed by the square root of the arc-sine to fit homocedasticy and a twoway ANOVA was performed. Normality was tested by Shapiro-Wilks test. Multiple comparisons between medias were made among pathogens within the same antagonist with multiple range Tukey's test (α=0.05). All statistical analyzes were done using the statistical program INFOSTAT . Seventy-two fungal strains were isolated from four grass species collected, the vast majority of which were ascomycete fungi (60 isolates). The main taxa isolated belong to the genera Acremonium, Alternaria, Aspergillus, Curvularia, Fusarium, Penicillium and Stemphylium. Additionally, 12 unidentified fungal strains were isolated (Figure 1). Regarding the isolation of endophytic fungi from the grass species analyzed, a greater number of endophytes were found associated with B. catharticus collected in Funes, which showed 55% of infection over the total of plants sampled (Table 2). On the other hand, P. notatum contained the lowest number of fungi (three isolates), two belonging to the genus Acremonium and one to Stemphylium (Table 2). Several endophytic fungal isolates were found in both sampling sites, such as Acremonium sp.1, 4, 5, 6 and 8, Aspergillus sp.1, Fusarium sp.2 and Pencillium sp.4 (Table 2). 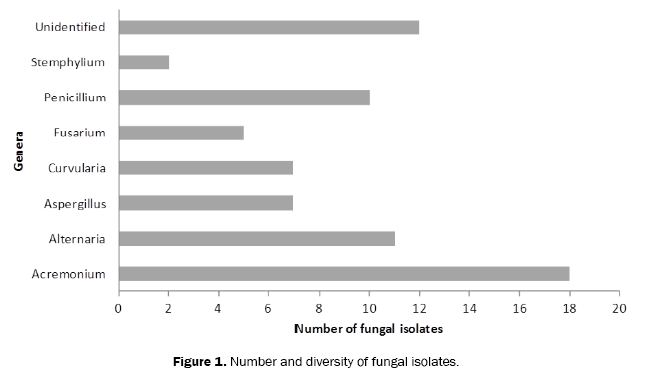 Figure 1: Number and diversity of fungal isolates. Table 2. Morphological characterized fungal isolates listed by sampling zone and by host grass species. As regards the pathogens, A. alternata was isolated only from P. dilatatum, while the other isolates of the genus Alternaria were all isolated from B. catharticus. All the fungi belonging to the genus Curvularia were isolated from P. dilatatum, except for Curvularia sp.1 (034) which was obtained from B. biebersteinii (Table 2). Several isolates identified as Fusarium sp.2 were obtained from B. catharticus, B. bierbersteinii and P. dilatatum in both sampling areas. Meanwhile, Fusarium sp.1 was isolated from B. catharticus. The isolates classified as Aspergillus were found in the four plant species and in both sampling sites (Table 2). Although Penicillium and Stemphylium are considered pathogens of several plant species [41,42], they were not considered pathogens in this study since they were obtained from plants without symptoms of disease. A morphological characterization of the 72 isolates was carried out. Microscopically, 18 of the 72 isolates showed septate hyphae giving rise to thin, tapered, mostly lateral phialides produced singly or in small groups. Unicellular conidia were produced in mucoid heads or unconnected chains and the hyphae were usually hyaline. Macroscopically, colony reverse showed variation in the intensity of the yellow or orange pigmentation among isolates. Considering all the characteristics mentioned above, these 18 isolates were all classified as Acremonium spp. (Table 2) . Additionally, ten isolates grew fast forming colonies in shades of green, sometimes white, mostly consisting of a dense felt of conidiophores. Microscopically, chains of single-celled conidia (ameroconidia) were observed in basipetal succession from a specialized conidiogenous cell called a phialide. Phialides could be observed singly or in groups, a pattern typical of Penicillium . Finally, two isolates (012 and 028) grew fast forming velvety to cottony colonies in colors gray, brown, or brownishblack and black reverse. Microscopically, they presented septate hyphae, conidiophores, and conidia. The hyphae were pale brown to brown in color. Conidiophores were dematiaceous (simple or branched), with a number of vesicular swellings or nodes. These isolates where classified as Stemphylium . To confirm the taxonomic position of these fungi, phylogenetic analyses were performed. The rRNA ITS (ITS1-5.8S-ITS2) and elongation factor 1 alpha (TEF1) sequences obtained from eight of the Acremonium isolates and GenBank (www.ncbi.nlm.nih.gov/) sequences belonging to 22 genera (Acremonium, Calonectria, Claviceps, Cordyceps, Cylindrium, Dussiella, Echinodothis, Emericellopsis, Fusarium, Gliomastix, Hypocrea, Hypocrella, Ilyonectria, Metacordyceps, Metarhizium, Microcera, Myrothecium, Mycoarachis, Moelleriella, Sarocladium, Simplicillium and Trichodema) were compared. The PHYLOGENY platform allowed the analysis of the data in a simple and robust way, using maximum-likelihood (ML) tree construction, which is commonly recognized as one of the most accurate approaches in molecular phylogenetics . The topology of the tree constructed using ITS sequences showed 7 of the 8 isolates as being related to Simplicillium (Figure 2A). Simplicillium lanosoniveum and S. obclavatum are considered synonyms of Acremonium lanosoniveum and A. obclavatum, respectively (www.mycobank.org). On the other hand, isolate 40 showed no clustering pattern to the rest of the groups included in this tree. Moreover, the tree constructed using TEF1 sequences allowed to confirmed the classification of three isolates (058, 064 and 073) as Simplicillium (Figure 2B). The other 5 isolates were not included in this analysis because the PCR reactions rendered no amplification products using TEF1-specific primers. Figure 2: Phylogenetic analyses. 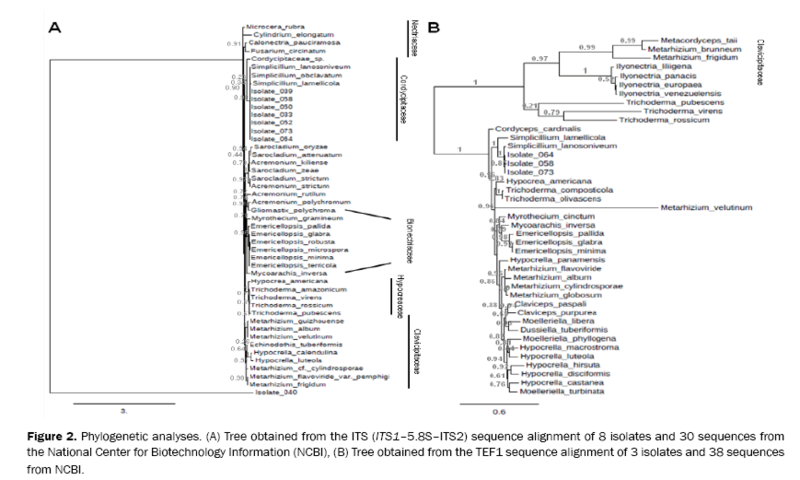 (A) Tree obtained from the ITS (ITS1–5.8S–ITS2) sequence alignment of 8 isolates and 30 sequences from the National Center for Biotechnology Information (NCBI), (B) Tree obtained from the TEF1 sequence alignment of 3 isolates and 38 sequences from NCBI. The percentage of growth inhibition (PGI) and pathogen growth inhibition category (GIC) are presented in Table 3. Endophytes of the genus Acremonium showed different antagonistic activity against the pathogenic species tested. Isolate 033 had the highest antagonistic activity against A. alternata (Figure 3A) and Alternaria sp., with a PGI of 91.42% and 91.35%, respectively, and both with a GIC of 4 (Table 3). Isolates 040 and 052 (Figure 3B) also had a GIC of 4 (with PGI of 77.14% and 76.18%, respectively) for A. alternata, whereas isolates 050 and 064 showed the lowest percentage of inhibition (with PGI of 44.76% and 39.04%, respectively) and a GIC of 2. Antagonistic effect of isolate 064 against Alternaria sp. had the lowest value of PGI (4.93%) and a GIC of 1 (Table 3). Table 3. Antagonistic activity of fungal endophytes. Figure 3: Dual cultures grown for 3 weeks at 28ºC. 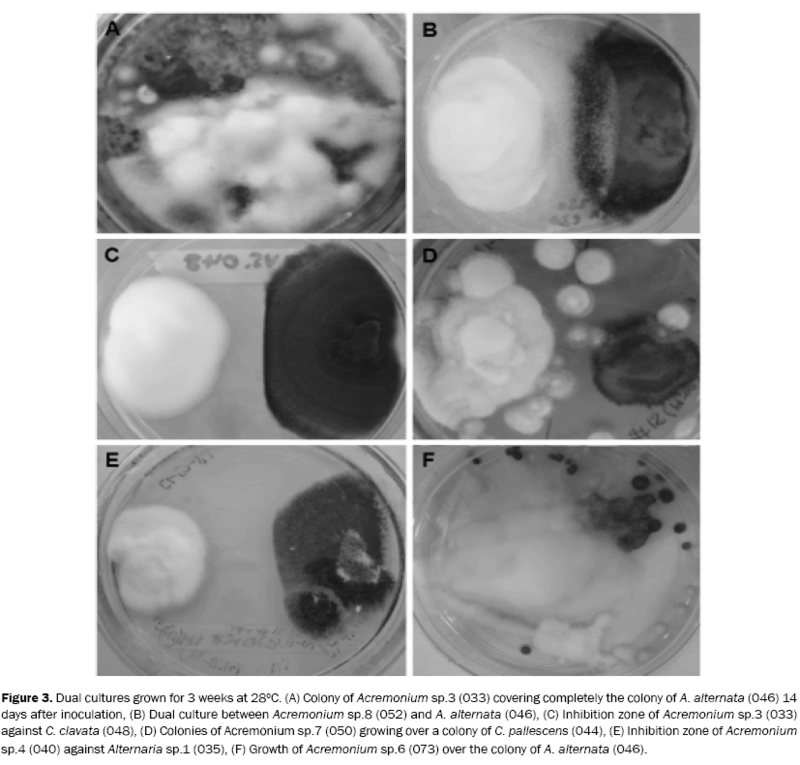 (A) Colony of Acremonium sp.3 (033) covering completely the colony of A. alternata (046) 14 days after inoculation, (B) Dual culture between Acremonium sp.8 (052) and A. alternata (046), (C) Inhibition zone of Acremonium sp.3 (033) against C. clavata (048), (D) Colonies of Acremonium sp.7 (050) growing over a colony of C. pallescens (044), (E) Inhibition zone of Acremonium sp.4 (040) against Alternaria sp.1 (035), (F) Growth of Acremonium sp.6 (073) over the colony of A. alternata (046). For the pathogenic species C. clavata, the greatest antagonistic effect in the dual culture was obtained against isolate 050 with a PGI of 63.20%, followed by isolate 033, with a PGI of 55.43% (Figure 3C). In the other dual confrontation against C. clavata, the percent of inhibition was similar (44.43-49.86%), with a GIC of 2 (Table 3). For C. pallescens, the highest PGI (83.80%) in the dual culture was obtained versus isolate 050 (Figure 3D), followed by a PGI of 76.18% for isolates 033 and 073. The lowest PGI (28.56%) was evidenced in the dual confrontation with isolate 064. Finally, Fusarium sp. was the pathogenic species that showed the lowest inhibition in the dual confrontation, with GIC values ranging between 1 and 2. The highest PGI (35.13%) was obtained with isolate 064. In general terms, isolate 064 showed the lowest inhibition against the pathogenic species tested, except for Fusarium. On the other hand, isolate 033 exhibited the highest values of inhibition (Table 3). As regards the zones of inhibition observed in the dual cultures, isolate 040 versus A. alternata showed a strong inhibition zone (15-18 mm) (Table 4). Similarly, the inhibition zone against Alternaria sp. was of 17-20 mm (Table 4 and Figure 3E). Inhibition zones from moderate to weak were observed in the dual cultures of isolate 050 against C. pallescens (Table 4), and no inhibitory halo was evidenced (Figure 3D). In the dual cultures against Fusarium sp., no inhibition halo was observed after 14 days of incubation with any of the isolates tested as antagonistic (Table 4). Table 4. Inhibiton zones (IZ)a of the fungal antagonists. aIZ: No inhibition zone= -; very weak= +, 0-5 mm; weak= ++, 5-10 mm; moderate= +++, 10-15 mm; strong= ++++, 15-20 mm; very strong= +++++, > 2 mm. Dominant endophyte taxa commonly found in grasslands differ depending on the region under study. The results obtained by STONE [45-49] showed that the dominant endophyte taxa found in temperate grasses places are Alternaria, Acremonium, Cladosporium, Penicillium, Epicoccum and Aureobasidium spp. These studies suggest that endophytic species of temperate and tropical grasses appear to have low host specificity, since they can be found in many grass species. Endophyte mycobiota associated with a particular pasture usually consists of a relatively large number of fungal species . Plant anatomical structure, leaf size and chemical components of grass species are important factors to consider that may affect diversity of fungi found in them [49,50]. In this work, the highest percentage of endophyte infection (55%) was observed in plants of B. catharticus collected from Funes. This may be due in part to differences in crop management and the characteristics of the plant species present in both sampling areas. Sampling area in Funes belonged to natural grassland between horticultural crops under organic management, while in Zavalla it was a seed implanted pasture under conventional management. Since seeds generally have a prior antifungal treatment, the transmission of endophytes in this case would occur by the spores that persist in the soil which colonize the hosts . On the other hand, P. dilatatum species from Funes area showed 33% of endophyte infection. In the present study the morphological analysis detected the genus Acremonium associated to cosmopolitan temperate grass species of the genera Paspalum and Bromus. This finding would contribute to the list of endophytes from the order Hypocreales in temperate areas, since to our knowledge, there are no reports related to the isolation of Acremonium species associated with these forage species. However, some of these isolates were classified as Simplicillium based on molecular analyses. Species belonging to this genus have been isolated from soil, plant tissues, fungi, nematodes and human nails . Most species of this genus do not appear to be plant pathogens and some of them have been reported to be mycoparasites. Particularly, S. lamellicola BCP effectively suppressed various plant diseases caused by pathogenic fungi, including B. cinerea, and was commercialized as the microbial fungicide Acre . It is worth noting that this strain, which was isolated from the mycelia of B. cinerea, was previously known as Acremonium strictum BCP . Interestingly, two of the fungal isolates described in this work (039 and 052) were classified as A. strictum. In the dual cultures of Acremonium sp. against Alternaria sp. and A. alternata, the largest antagonistic effect was observed with Acremonium sp.3 (033), though a similar result was obtained with Acremonium sp.4 (040). The percent of inhibition of both antagonistic strains of Acremonium allowed their classification in the highest category for inhibiting pathogen mycelial growth (GIC) (Table 3). However, it was interesting to observe the inhibition zones in the dual cultures against the pathogenic strains of Alternaria sp. and A. alternata, since both antagonistic strains showed a different behavior when faced to these pathogens. A strong inhibition zone was observed in the dual culture with Acremonium sp.4 (040) with both pathogens, while there was a very weak zone of inhibition with Acremonium sp.3 (033) (Table 4). These results suggest that the mechanism of action of both antagonistic strains may differ despite they presented a similar antagonistic effect. Mycoparasitism and production of secondary metabolites or hydrolytic enzymes are both feasible mechanisms operating in the antagonic action. In the case of Acremonium sp.3 (033) mycoparasitism seems to be involved in the antagonism , since this strain grew on Alternaria sp. and A. alternata, covering the entire medium in the Petri dish with its mycelium, and thus humpering the pathogenic strains growth (Figure 3A). For that observed in dual culture with Acremonium sp.4 (040), production of secondary metabolites by the strain, which would constrain the development of the pathogenic fungus, seems to be the more feasible mechanism of antagonism (Figure 3E). Competition for nutrients could be also possible [56,57]. Acremonium sp.7 (050) exhibited increased antagonistic activity against C. pallescens when compared to strains of Alternaria (Table 3). In the dual culture with C. pallescens, the mechanism of antagonism of Acremonium sp.7 (050) seems to be mycoparasitism, since C. pallescens spores were surrounded by large number of spores of the antagonist, which were larger and some of them were hampering the germ pores (data not shown). Acremonium sp.7 (050) hyphae invading pathogen fungal structures were also observed. In the dual cultures with Curvularia sp. a moderate inhibition zone was observed, suggesting that the production of secondary metabolites could be the mechanism of the antagonism (Table 4 and Figure 3D). These results suggest that the interactions and mechanisms of antagonism of the same antagonistic strain vary according to the pathogenic strains to which they are faced to in the dual cultures. Moreover, the analysis of variance showed that there is an interaction between the antagonistic and the pathogens, indicating that the inhibition of the pathogens depends on the antagonistic species. From the above mentioned, we hypothesized that pathogenic strains could modulate or influence in the behavior of the antagonist and vice versa. The similar values of PGI showed by the same antagonistic strain against different pathogenic strains, though to the differences observed between the zones of inhibition, appear to support this hypothesis (Figure 3 and Table 3). The antagonistic strains tested showed no activity against Fusarium sp.1 (Tables 3 and 4). It also had a higher rate of growth in the dual culture and no presence of inhibitory halo was observed (data not shown). Acremonium sp.2 aff. killiense (064) which evidenced the lowest percentages of inhibition against Alternaria and Curvularia was the only strain capable of exerting a weak antagonistic effect on the growth of Fusarium sp.1 (Table 3). It is important to note that in vitro results are not necessarily indicative of what occurs in the plant. However, the in vitro study of antagonists-pathogens is a practical approach in order to identify good candidates for use in biological control. The in vitro studies also allow understanding the possible mechanisms by which the candidate strains reduce the damage caused by pathogens. The finding of endophytes with antagonist effects could be translated to useful applications to improve the performance of plants, as an alternative to the use of chemicals to control pests. Finally, based on the results obtained in this study, we propose that the isolates of the Acremonium endophyte are good candidates for biological control of latent pathogenic species in pastures as A. alternata, Alternaria sp., C. clavata and C. pallescens. However, since the antibiotic effect varied in a species-specific way, further research will be necessary to complement these results. Specifically, studies focused on the analysis of the secondary metabolites produced by the antagonists in the culture medium, as well as studies in planta, will contribute to elucidate the antagonistic effect of the strains tested. Thanks are due to Ing. Agr. Marcelo Larripa for his valuable assistance in the identification of the plant material. We are also grateful with Mr. and Mrs. Hein for allowing us to take samples in their organic farm in Funes. We also thank Dr. Pedro Gundel for his useful comments and suggestions on the manuscript. This work was supported by: Agencia Nacional de Promoción Científica y Tecnológica (ANPCyT), Ministerio de Ciencia y Tecnología, Argentina, PME-2006-03083; Universidad Nacional de Rosario, Project AGR206; Fundación Ciencias Agrarias and Fundación Nuevo Banco de Santa Fe. M. L. Gil-Cardeza received a fellowship from CONICET (Consejo Nacional de Investigaciones Científicas y Técnicas, Argentina). S.A. Felitti is a career member of CONICET. De Bary A. Morphology and physiology of fungi, lichens and myxomycetes. Hofmeister’s handbook of physiological botany, Germany; 1866. Bacon CW and White JF. Biotechnology of endophytic fungi of grasses. CRC Press, Boca Raton; 1994. Kusari S, et al. Chemical ecology of endophytic fungi: Origins of secondary metabolites. Chemical Biology. 2012;19:792-798. Salgado C and Cepero MC. Isolation of endophytic fungi in Rosa (Rosa hybrida) in Bogotá, Colombia. Revista Iberoamericana de Micología. 2005;22:99-101. Tan R and Zou W. Endophytes: A rich source of functional metabolites. The Royal Society of Chemistry. 2001;18:448-459. Kuldau G and Bacon C. Clavicipitaceous endophytes: Their ability to enhance resistance of grasses to multiple stresses. Biological Control. 2008;46:57-71. Rodriguez RJ, et al. Fungal endophytes: Diversity and functional roles. New Phytologist. 2009;182:314–330. Daguerre Y, et al. Fungal proteins and genes associated with biocontrol mechanisms of soil-borne pathogens: a review. Fungal Biol Rev. 2014; 28:97-125. Kobayashi DY and Columbo JD. Bacterial endophytes and their effects on plants and uses in agriculture Microbial Endophytes, New York; 2001. Backman PA and Sikora RA. Endophytes: An emerging tool for biological control. Biological Control. 2008;46:1-3. Baker KF. Evaluating concepts of biological control of plant pathogens. Annu Rev Phytopathol. 1987;25:67-85. Narayanasamy P. Mechanisms of action of fungal biological control agents. biological management of diseases of crops. Progress in Biological Control. 2013;15:99-200. Gundel PE, et al. Symbiotically modified organisms: non–toxic fungal endophytes in grasses. Trends in Plant Science. 2013;18:420–427. Clay K. Endophytes as antagonists of plant pests. In: John HA, Hirano SS, eds. Microbial ecology of leaves. Springer Series in Contemporary Bioscience, New York; 1991. Hacker J, et al. Simulate frosting of tropical grasses. Aust J Agric Res. 1974;25:45-57. Sánchez MS, et al. Diversity and structure of the fungal endophytic assemblages from two sympatric coastal grasses. Fungal Diversity. 2008;33:87-100. Clarck EM, et al. Improved histochemical technique for the detection of Acremonium coenophialumin tall fescue and methods of in vitro culture of fungus. J Microbiol Methods. 1983;1:149-155. Craven KD, et al. Hybrid fungal endophytes symbiotic with the grass Lolium pratense. Sydowia. 2001;53:44-73. Arenas R. Illustrated Medical Micology. Clínica, laboratorio y terapéutica. McGraw Hill, México D.F;1993. Carrillo L. Los hongos de los alimentos y forrajes, primera ed. Universidad Nacional de Salta, Salta; 2003. Carmichael JW, et al. Genera of Hyphomycetes, 1sted. The University of Alberta Press, Edmonton;1980. Sutton BC. The Coelomycetes. Fungi Imperfecti with Pycnidia, Acervuli and Stromata, 1st edn. Commonwealth Mycological Institute, Kew; 1980. Von Arx JA. The genera of fungi sporulating in pure culture, 3rd ed. Cramer J, Vaduz; 1981. Redilin SC and Carris LM. Endophytic fungi in grasses and woody plants. Systematics, Ecology and Evolution. APS Press, St. Paul, MN; 1996. Barnett HL and Hunter BB. Illustrated genera of imperfect fungi, 4th ed. American Phytopathological Society Press, St. Paul, Minnesota; 1998. Ulloa M and Hanlin RT. Illustrated dictionary of mycology, 1st ed. APS Press, St. Paul; 2000. Samson RA, et al. Introduction to food-borne Fungi, 7th ed. Centraalbureau voor Schimmelcultures. Utrecht, The Netherlands; 2004. Möller EM, et al. A simple and efficient protocol for isolation of high molecular weight DNA from filamentous fungi, fruit bodies and infected plant tissues. Nucleic Acids Research. 1992;20:6115-6116. Allen GC, et al. A modified protocol for rapid DNA isolation from plant tissues using cetyltrimethylammonium bromide. Nat Protocols. 2006;1:2320-2325. White TJ, et al. Amplification and direct sequencing of fungal ribosomal RNA genes for phylogenetics. PCR Protocols: A guide to methods and applications. Academic Press, Orlando;1990. James TY, et al. Reconstructing the early evolution of fungi using a six-gene phylogeny. Nature. 2006;443:818-822. Schoch CL, et al. Nuclear ribosomal internal transcribed spacer (ITS) region as a universal DNA barcode marker for Fungi. Proceedings of the National Academy of Sciences, USA. 2012;109:6241-6246. Dereeper A, et al. Phylogeny.fr: robust phylogenetic analysis for the non-specialist. Nucleic Acids Res. 2008;465-469. Edgar RC. MUSCLE: multiple sequence alignment with high accuracy and high throughput. Nucleic Acids Res. 2004;32:1792-1797. Talavera G and Castresana J. Improvement of phylogenies after removing divergent and ambiguously aligned blocks from protein sequence alignments. Systematic Biology. 2007;56:564-577. Guindon S, et al. New algorithms and methods to estimate maximum-likelihood phylogenies: Assessing the performance of PhyML 3.0. Systematic Biology. 2010; 59:307-321. Fokkema NJ. Fungal antagonism in the phylosphere. Annals of Applied Biology. 1978;89:115-117. Skidmore AM and Dickinson CH. Colony interactions and hyphal interference between Septena nodurumand phylloplane fungi. The British Mycological Society. 1976;66:57-64. Živković S, et al. Screening of antagonistic activity of microorganisms against Colletotrichum Acutatumand Colletotrichum Gloeosporioides. Arch Biol Sci. 2010;62:611-623. Di Rienzo JA, et al. InfoStat versión 2011. Grupo InfoStat, FCA. National University of Cordoba, Argentina. 2011. Inderbitzin P, et al. Pleospora species with Stemphylium anamorphs: A four locus phylogeny resolves new lineages yet does not distinguish among species in the Pleospora herbarum clade. Mycology. 2009;101:329-339. Visagie CM, et al. Identification and nomenclature of the genus Penicillium. Studies in Mycology. 2014;78:343-371. Summerbell RC, et al. Acremonium phylogenetic overview and revision of Gliomastix, Sarocladium and Trichothecium. Studies in Mycology. 2011;68:139-162. Ellis MB. Dematiaceous Hyphomycetes. Mycological Papers. 1971;125:1-30. Stone JK, et al. Endophytic fungi. Biodiversity of Fungi. Inventory and Monitoring Methods. Elsevier Academic Press, Atlanta. 2004;241-270. White IR and Backhouse D. Comparison of fungal endophyte communities in the invasive panicoid grass Hyparrhenia hirta and the native grass Botriochloa macra. Aust J Bot. 2007;55:178-185. Porras AA, et al. Novel root fungal consortium associated with a dominant desert grass. Appl Environ Microbiol. 2008;74:2805-2813. Khidir HH, et al. A general suite of fungal endophytes dominate the roots of two dominant grasses in a semiarid grassland. J Arid Environ. 2010;74:35-42. Márquez S, et al. Non-systemic fungal endophytes of grasses. Fungal Ecology. 2012;5:289-297. Wong MKM and Hyde KD. Diversity of fungi on six species of Gramineae and one species of Cyperaceae in Hong Kong. Mycological Research. 2001;105:1485-1491. Walsh JL, et al. Fusarium: two Endophytic novel species from tropical grasses of northern Australia. Fungal Diversity. 2010;44:149-159. Lim SY, et al. Entomopathogenicity of Simplicillium lanosoniveum isolated in Korea. Microbiology. 2014;42:317-321. Choi GJ, et al. Mycoparasitism of Acremonium strictum BCP on Botrytis cinerea, the gray mold pathogen. J Microbiol Biotechnol. 2008;18:167–170. Le Dang Q, et al. Antimicrobial activities of novel mannosyl lipids isolated from the biocontrol fungus Simplicillium lamellicola BCP against phytopathogenic bacteria. ‎J Agric Food Chem. 2014;62:3363-3370. Gams W, et al. Fungicolous fungi. Biodiversity of fungi, inventory and monitoring methods. Elsevier, New York. 2004;343-392. Heuvel J and Van Den. Antagonism between pathogenic and saprophytic Alternaria species on bean leaves. Ecology of Leaf Surface Microorganisms. Academic Press, London. 1971;537-544. Mishra RR and Tewari RP. Studies on biological control of Puccinia graminis tritici. Microbiology of Aerial Plant Surfaces.Academic Press, London. 1976;559-567.